Dallas is a 10 year and 5 month old 135 pound female spayed Great Dane with a progressive history of episodes of back pain, osteoarthritis, weakness, and neurologic deficits. She was treated medically with anti-inflammatories, supplements, and pain medications until her condition declined and she was not able to rise and walk on her own. Acupuncture and laser therapy treatments were used as a last resort before humane euthanasia to great effect. After the first treatment, Dallas was able to rise and walk on her own and continued to improve with each treatment. Dallas is a 10 year and 5 month old 135 pound female spayed Great Dane with a history of neurologic issues beginning in 2009 with a “clutzy” presentation and inability to walk straight. The initial veterinarian listed a differential diagnosis of Wobblers’. Dallas first presented for back pain 5/14/16; radiographs showed ventral spondylosis of thoracic vertebral spaces 6-7 (T6-7) and T7-8. She was treated with Tramadol, a tapered dose of prednisone, and methocarbamol and recovered well. The next back pain episode happened on 11/4/16; she was treated with prednisone and methocarbamol (no Tramadol) and recovered well. She began on glucosamine supplementation at some point and her owner reported increasing difficulty rising and general mobility at a wellness exam on 3/24/18. At this time, she was started on daily Meloxicam. Toe grips were applied to back paws to aid in mobility on 5/23/18. Tramadol (200mg by mouth twice daily) was added to her daily medications on 6/25/18 due to increased pain and decreased mobility. Dallas’ right rear 5th phalanx was removed due to a nail bed tumor on 9/26/18 and the histopathology reported mature granulation tissue and a fibrolipoma. Dallas presented for worsening of signs on 12/30/18 and exam showed generalized hind end weakness, knuckling of the left hind paw, crossing of the hind limbs, and guarding of her lumbar spine. The veterinarian recommended radiographs, acupuncture and Gabapentin. Gabapentin was added to daily medications and laser treatments with a K-laser were started on 1/7/19. Radiographs shows spondylosis of T3-4, T4-5 (severe), T5-6 (severe), T6-7, T7-8, T13-lumbar vertebra 1 (L1), L1-2, L2-3, L3-4 (minimal), L4-5 (minimal) and L6-7. Dallas continued to decline; she was not able to rise on her own and her elderly owners were unable to assist effectively. The Arnolds were considering humane euthanasia due to Dallas’ continually declining quality of life, but were convinced to try acupuncture before euthanasia. 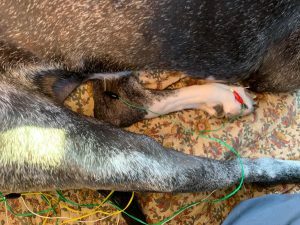 Dallas’ first acupuncture treatment was done on 1/9/19 with owners planning to euthanize 1/11/19 if no improvement. All exams and treatments performed in owners’ minivan. Temperature, pulse and respiration all within normal limits for all exams. Dallas is taking daily Meloxicam and Tramadol. Dallas had weak withdrawals bilaterally in the hind end and was unable to rise, stay standing, or walk without significant assistance. She sways when standing and cannot stay standing long enough to eat a meal (per owner, she will fall down mid-meal). Moderate pain on palpation of L6-8 and the lumbosacral space. When placing acupuncture needles, the only response caudal to L6 was when a carbo 0.2×30 was placed in right GB 31. Tight bands palpated bilaterally in caudal cervical region and bilaterally in deltoid and latissimus. Bilateral severe muscle atrophy (flexors more atrophied than the extensors) of hind limbs, worse on the right. Per owner, Dallas was able to get up and move around on her own after getting home on 1/9/19. For the first time in months, she got in and out of her sofa on her own and ran around in the yard. Minimal pain on caudal lumbar palpation, otherwise exam the same as 1/9/19. Per owner, Dallas seemed very painful on the night of 1/10/19 but was much better on the morning on 1/11/19; she got up on her own, ate breakfast standing up and went out in the yard to go to the bathroom. Dallas was standing in the van on presentation. Increased sensation and tone in hind limbs; Dallas can now move feet independently from upper limb but withdrawal is weak and incomplete. She was non-painful on palpation of the lumbar spine. Bilateral taut bands in caudal cervical region non-painful on exam. Although Dallas was still severely weak, she could position her hind legs, stay sternal for exam and treatment, and stand unassisted. Extensor muscles of hind limbs moderately and flexors severely atrophied. Per owner, Dallas is back to her “wild self” jumping on furniture, running around backyard, etc. On presentation she was anxious and severely ataxic. Owner had panic attack the night before and Dallas has been “not right” since then. This is the first exam where gate could be evaluated. Dallas had a pacing gate with occasional dragging of hind feet, and ataxia and weakness in the hind end with lumbar kyphosis that gradually improves with more movement. Dallas was moderately painful on palpation of lumbosacral junction and had sluggish but consistent withdrawals in both hind limbs. Dallas was able to tuck legs underneath herself and roll from one side to the other fairly easily on exam and treatment. Extensor muscles of hind limbs moderately atrophied; flexors severely atrophied. Significantly improved sensation especially distally and increased muscle tone and mass especially of extensors. The main goal for initial treatment is to regain neurologic and musculoskeletal function in the hind end to allow Dallas ambulate without assistance. 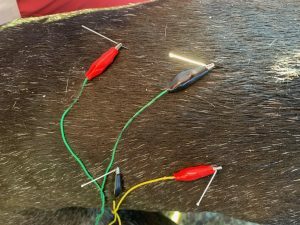 Due to the urgency of the situation, aggressive stimulation of many points caudal to the painful spinal lesion with both electrical stimulation and dry needling using mostly uncoated needles was done. Although addressing myofascial dysfunction cranially due to compensation is important, it is not the primary focus of treatment. Following treatments are focused on continuing to stimulate neurologic function in the hind end, relieve pain of spinal lesions, and encourage muscle development. GV 20, GV 14, and Bai Hui placed to evaluate response to needles and to calm patient at the beginning of every treatment. All needles placed are Carbo 0.2x30mm unless otherwise noted. 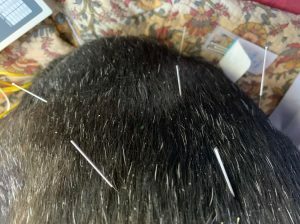 All acupuncture treatments were accompanied by a K-laser treatment from the cervical to sacral spine lasting 9 minutes total with continuous wave at 2280J and 12 W.
1/9/19- Seirin 0.2x30mm needles placed in BL 11 bilaterally in the caudal aspect of bilateral tight bands and bilaterally in two cervical trigger points. Five Seirin 0.2x10mm needles placed on the huatuojiaji line alternating vertebral spaces from T12-L3 for 3 minutes then removed to stimulate dorsal spinal nerves. BL 25 to BL 27 stimulated for 20 minutes bilaterally with Ito ES-130 at 170 Hz. Hip triad (GB 29, BL 54, and GB 30), GB 31 (response on placement), ST 36, BL 60, and bafeng points placed bilaterally with ST 36 to a bafeng point stimulated with the Ito ES-130 at 500 Hz on right (no response to stimulation) and 380 Hz on left (minimal response to stimulation). KI 1 placed on the left and LR 3 and ST 34 on the right due to patient position. 1/10/19- BL 23 placed bilaterally with Ito ES-130 at 270 Hz from BL 24 to BL 25 for 10 minutes to address back pain. Hip triad, ST 34, ST 36, SP 10, BL 60, LR 3, and bafeng points placed bilaterally with GB 30 to ST 34 and BL 60 to LR 3 stimulated with the Ito ES-130 at 210 Hz for 10 minutes bilaterally. 1/11/19- GB 21 stimulated with asiamed 0.2x30mm needles bilaterally in caudal portion of tight bands. BL 25 to BL 27 stimulated bilaterally with Ito ES-130 at 80 Hz for 10 minutes. Hip triad, GB 31, ST 36, SP 10, BL 60, LR 3, and bafeng points placed bilaterally with GB 30 to GB 31 and BL 60 to a bafeng point stimulated with the Ito ES-130 at 170 Hz for 10 minutes bilaterally. 1/15/19- All needles placed are DBC 0.2x30mm unless otherwise noted. BL 25 placed bilaterally with Ito ES-130 from BL 23 to BL 24 at 80 Hz for 10 minutes to address back pain. BL 54 (carbo 0.2x40mm), GB 30 (carbo 0.2x40mm), GB 31, SP 10, BL 60, and bafeng points placed bilaterally with GB 30 to GB 31 and BL 60 to a bafeng point stimulated with the Ito ES-130 at 210 Hz for 10 minutes. ST 36 and BL 40 were placed on the right and SP 6 on the left due to patient position. All pictures and videos are from this date. 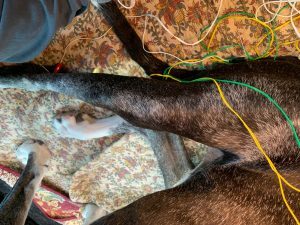 Dallas had an excellent response to acupuncture highlighted by the fact that adding acupuncture was the only change in her treatment regime and it was a last resort before euthanasia. In addition to the main goal being reached after the first treatment (Dallas being able to rise and ambulate on her own), at each treatment, Dallas became more responsive and muscle development clearly improved. Although I did not know the dog before, the owner feels that her dog’s personality has returned, for good and bad; Dallas began getting into trouble again at home. After the second treatment, Dallas became very sore and sluggish at home and I discussed with owner that her muscles are likely very sore from the sudden increase in activity that she has not been able to do for months. This was a brief adverse effect I had not expected. Although not necessarily an adverse event, the owner is now hyper-aware of changes in Dallas’ way of moving and physical abilities at home. Discussing the road to recovery and rehabilitation with her sleep-deprived and worried owner continues to be difficult. Dallas was an excellent learning case for me, my technicians, the other veterinarian at the clinic, and especially the owner. At the second treatment, the owner told me, “I never believed in this crap, but I guess it works.” Although this is gratifying to hear and the owner is now heavily promoting acupuncture on social media, I learned just how much educating it will take for staff and owners alike to understand and embrace medical acupuncture and associated treatments.